This is our neighbor Mike. He and his family live in the house that belonged to Dorothy and George (Abby’s first in-laws) since 1954. 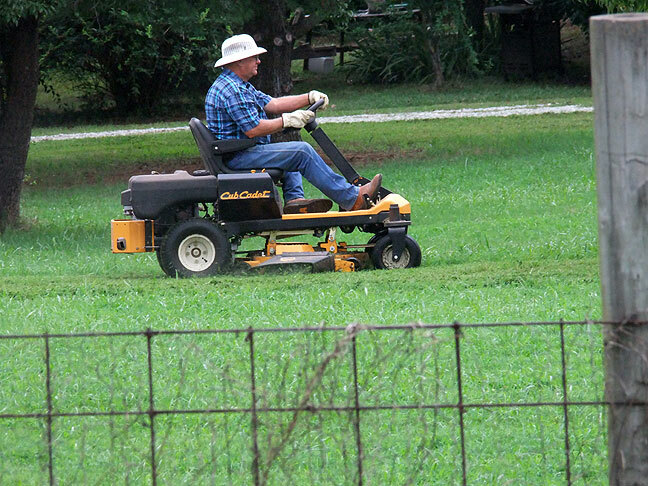 Mike and I often pass each other on our mowers, sometimes just waving, other times stopping to talk for a few. Yesterday was the solstice, meaning it is now summer. All my Oklahoma friends know how ridiculous this spring was in terms of weather. The May of Rain was followed by Tropical Storm Bill. For many, this meant flooded homes and washed out bridges, but for Abby and me, who live on a hilltop on our little patch, it has meant lush, green pastures and yards, unprecedented growth of our trees, and, sadly, failure in my vegetable garden. 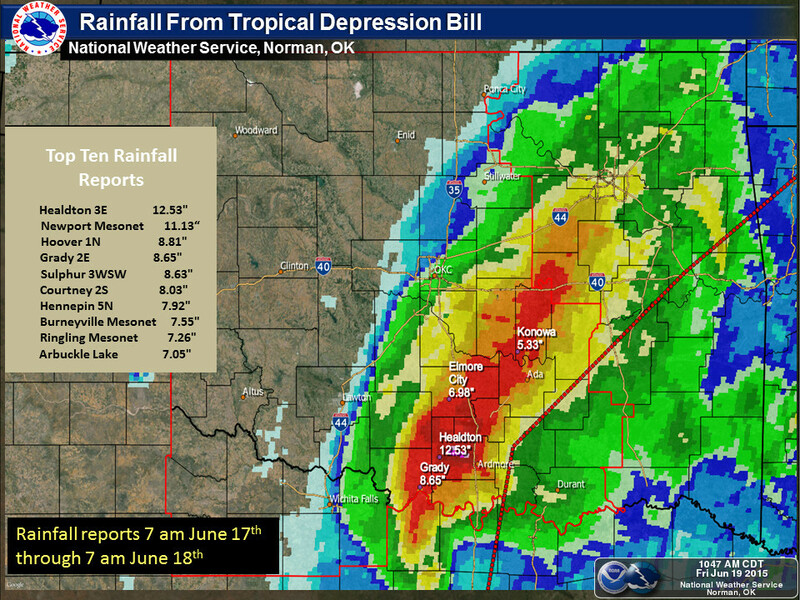 This is the Weather Service’s final rainfall total in Oklahoma from Tropical Storm Bill last week. I’ve been keeping up with the mowing. In drought years I often say I’d rather be mowing, and it’s true: I love it when I cut the grass in our yards. I maintain about a third of the seven acres where we live, and it looks like a golf course or a baseball outfield when I finish cutting it. It’s great to be outside where the air is fresh and life is abundant. Abby got an inspiration the other day and bought a propane grill. We immediately set it up and cooked out. She skewered peppers, mushrooms, onions and tomatoes, and roasted some potatoes in an aluminum pan. I grilled a couple of veggie dogs, and the only meat on the grill was two small chuck steaks for her. It was fun and everything tasted good, and it got her outside. I think we are planning to do it again tonight. I hope I don’t talk too much about how much we love living in the country, but we do love it so. Abby skewered these vegetables for us. Grilling them really brought out their natural flavor. We use ours all the time, Wil. Get an inexpensive one and don’t bother maintaining it. Buy a new one when that one gets spooged over. Wasteful? Maybe, but that’s the way we roll. 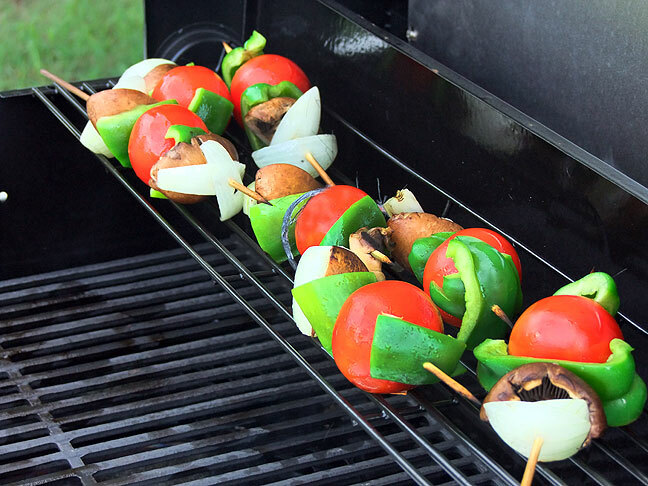 As for veggie skewers, toss them in olive oil and season with Tony’s or Emeril’s prior to grilling. Why did the rain ruin the garden? Not enough drainage? Our beds are raised as you know. Right now we’re impatiently waiting for the tomatoes to ripen, but the cucumbers are glorious. When it rains like it did in May, 100% of my energy goes into staying ahead of the patch. Between mowing and lopping branches and weed whacking, there just wasn’t time to weed the garden and give it the TLC it needed. Abby’s squarsh and my marigolds are about it.